Welcome to the field of creative passion and evergreen desire to create something extraordinary for user experience i.e. automotive designing. Are you in your +2 of educations career? Passionate about the car and bikes? You are at the right place in this articles we will know about the career path for a desire to towards cars and bikes, what steps that you can take to make your hobbies as your life your career. As 12th or 12+ students it's very hard to focus on one field and be clear with your ideas unless you are very clear with life that what you want. Well if you are a car lover or bike lover there is the best path for you to make your hobbies into your professional life. Automotive designing is a career, full of passion, creativity, and challenges to create something unique for the society. Now a simple question what should I do for becoming an automotive designer? I want to clear one thing before I move further since you are in 12th.I've seen many students who are interested in designing cars and motorcycle opt for engineering. This is partial, a wrong decision to make. However, door to automotive designing still opens if you are in your engineering. If you want to test and learn the technical things of machines and then want to move to design files than engineering and master in designing is the path for you. If you are the one you sketch a lot and more lean towards arts, I would suggest you to take bachelors degree in automotive designing before that there are many aspects that you have to consider. Automotive designing is course is little expensive than other career paths. So it is useful for you to understand the field and take the step further. You can refer the article on how to apply for colleges for bachelors or masters. There are short term courses available offline and online these small courses will help you improve your skills and take you closer to your goals. Almost all colleges run their own entrance exam to acquire the best talent in their basket. These crash courses will help you in almost all entrance exams. These are the few courses which will help you in understanding the industry and will help you throughout your life. If you want to learn all these from online click here and take an experience of what it is like to be an automotive designer. We are in an era where everything is going digital then why not designers, a student o class 5th is learning from online educational portals along with their regular schools, Why not designers? Where digital platforms have more impact on improving the skills as in any other profession. Rendering places a very important role in designing, and to get that one to one assistance in your college is not possible, so it is important you have a platform where you can learn any time and any number of times. This is only possible through online educational portals who teach automotive designing. Have one digital platform along with your daily school to learn extra to stand different from all your batch mates. Since you are in 12th, more than skills your desire towards learning and designing matters a lot, but in order to give a glance in of basic skills so to decide who can do automotive designing? Basic sketching: sketching is the first factor comes when you start your career or want to start designing for the company. 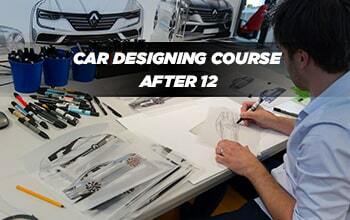 There is a difference in conventional sketching and sketching automotive designing, so it will be useful as fresher if you take these short term courses.